Who are we? FLORIDA MANATEES! What do we want? NOT TO BE COLD! How are we going to do it? BY SMOOSHING OUR BIG BODIES TOGETHER AND CLOSING DOWN THE THREE SISTERS SPRINGS TO SWIMMERS AND KAYAKERS! On Monday, 300 brave Sea Qweens overran Florida’s Three Sisters Springs, which promptly ceded to their demands for warmth and relaxation. Is that a pile of rocks? A giant festering mass of roly-poly bugs? No! It’s a manatee and 200 of her best friends, and they will take what’s theirs!!! The Crystal River National Wildlife Refuge posted on its Facebook page Monday that a portion of the spring would be closed to water access at 5 p.m. that day to allow the manatees to warm up and rest. USA Today reports that volunteers counted more than 300 manatees on Monday and that number went up Tuesday, according to Miles Saunders, media relations and marketing specialist with the Citrus County Visitor and Conventions Bureau. 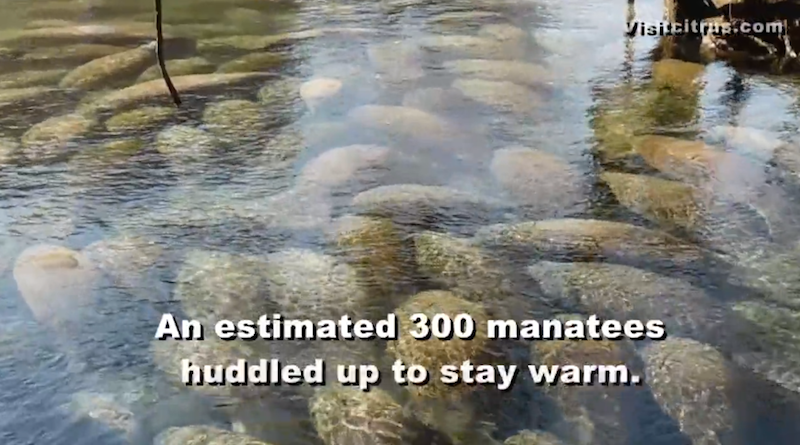 According to the Sentinel, manatees experience “cold stress” in water below 68 degrees, leading them to seek out the more temperate springs during the winter months. It’s kind of of like spring break, except instead of lying on the beach they are lying slightly underwater. Time reports that the unusually high number of manatees seen here in recent years is likely due to habitat loss around Florida. Hope you guys have an amazing time in Florida!